When Irish food writer Susan Jane White was advised to stay away from wheat, dairy and refined sugar during a debilitating illness, her food future seemed bleak, bland and boring. So, drawing on her gastronomic background, she created seriously tasty recipes that didn't compromise her health. The result? Susan Jane's energy levels went through the roof and her friends and family began to look for her `free-from' recipes whether or not they had intolerances. Inside is a collection of Susan Jane's most loved recipes. Dishes like Maple Cardamom Peaches, Bond Girl Salad and Banana Toffee Ice Cream, all so full of flavour that you would never believe they are `free from' anything. Susan Jane White is a specialist cook, food columnist with The Sunday Independent and former president of Oxford University's Gastronomy Society. When she was 25, Susan Jane developed a serious immune disorder. The first year of her illness saw 12 courses of antibiotics, steroids, anti-fungal colon treatment, many futile vaccinations - and a bad sense of humour. On top of this, her digestive system appeared to be conking out. This marked the beginning of her nutritional pilgrimage. She discovered that her energy levels were intimately linked with the food she ate, so she avoided the foods that taxed her body - anything processed or highly refined. And it worked! Two years later she was back to her bouncy, bionic self, much to the wonderment of the medical community. Her condition has not since returned - but her sense of humour has. 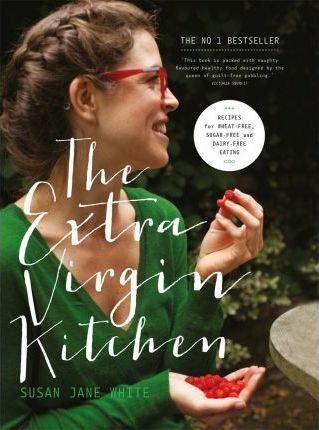 The Extra Virgin Kitchen debuted at No 1 on the bestseller list, gained a cult following and received a nomination for an Irish Book Award. She lives in Dublin with her husband and two little vandals.